The sensor behavior is measured using the laser interferometer discussed below in a temperature controlled environment, comparable to that in a high accuracy CMM. A schematic view of the plane mirror differential laser interferometer setup is shown in the figure below. The sensor to be calibrated (A) is attached to a bracket (B) and placed on top of the setup. The sensor tip is brought into contact with a measurement mirror (D). The measurement mirror is guided in z-direction using elastic hinges (not shown). A ring shaped reference mirror (C) is rigidly connected to the setup housing (F). The position of the measurement mirror relative to the reference mirror is controlled using a piezo actuator (E). Thus a displacement of the measurement mirror results in a displacement of the sensor tip. The measurement signal from the sensor as a result of this displacement is recorded. Simultaneously, the displacement of the measurement mirror relative to the reference mirror is measured using a hetrodyne laser interferometer (G). The measurement can be repeated for several positions of the measurement mirror. As mentioned, the behavior of the sensor can be measured for only one direction at a time with this setup. Therefore three V-shaped grooves are made on the top and on a side of the bracket (B). The sensor housing (G) has three spheres, which match the position of the V-shaped grooves. This connection is commonly referred to as a Kelvin clamp and allows an operator to rotate the sensor with respect to the bracket by 120 and 240 degrees respectively. The measurement and reference mirrors are close to each other, which decreases the thermal loop in the calibration setup. The reference and measurement mirror can be positioned symmetrically around the measurement axis which preserves the cylindrical symmetry of the calibrator. Measurement and reference beam have the same optical pathlength when the measurement and reference mirror are in the same plane. A homogeneous change in the refractive index will therefore will affect both beams equally and will therefore not disturb the measurement. 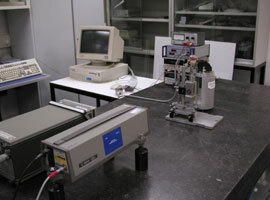 Measurement and reference beam go through the setup twice, doubling the sensitivity of the calibration setup. * The uncertainty of the calibrator is influenced by the uncertainty of the interferometer system, which is 1 nm, the uncertainty due to mechanical tolerances of the parts and alignment of the beams, which leads to a relative error of 0.1%, and an expected worst case thermal drift of 5.2 nm for a temperature change of 0.1 K.
The setup is placed in a temperature controlled laboratory, which is conditioned to plusminus 0.5 degrees Celsius. An isolation box limits the fluctuations to about 2-10 mK over a 15 minute interval, which is acceptable for the calibration and causes an error of 0.5 nm or less.